American Jobs: What Are You Doing About Them? With official government unemployment numbers hovering around nine percent, and real numbers between fifteen to twenty percent, it’s obvious that we have a serious problem in our country. Our government has tried all sorts of Keynesian tricks to use our money, and Chinese money, in futile attempts to jump start the economy it is destroying. I guess they think we won’t notice the dreadful job they have done if they can squeeze a few more jobs into the moribund business cycle. Unfortunately for us, and for them: they are wrong. Government officials say we are unpatriotic for not supporting their efforts. The reality is that it would just compound the foolishness if we got behind programs that we know will not be effective. Real patriotism involves working to take our country in the right direction. We are told it is just politics that leads to citizen resistance… but, it is just common sense. As with much in this world, those of us who depend on the national government to fix our problems will be sadly disappointed. As individuals, is there anything we can do to help restore the nation that was the arsenal of democracy during the second world war? Our government and the multi-national corporations have led us down the free trade path that gave us some lower prices, but at the cost of good paying jobs disappearing and miraculously reappearing in some third world sweat shop. Corporate profits rose and American workers income went down. Those of us who were caught up in our consumer driven society were only too happy buy more and more goodies at discount prices. Considering the self absorbed nature of the “me” society, it is not surprising that we sacrifice our neighbors and our economy so we can afford to buy more stuff. Over a period of time our penchant for buying cheaper products and corporate focus on profits at any price led to a migration of American jobs to other parts of the world. This whole process took place under the approving eye of our free trade leaders from both parties. 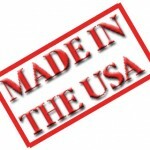 We have come to the point where it has become harder and harder to even find products made by American hands. We have been maneuvered into a position where we have little or no choice but to buy imported goods. However, for those weary of scouring your local malls in vain for domestic products, there is something you can do. That is something beyond complaining to the store manager. While it may make you feel better, there is usually little they can do about the purchasing decisions imposed from above. In response to this evaporation of American products from the shelves of American retailers, some enterprising entrepreneurs have developed web sites that bring together the remaining locally produced products. Buying this way will be a little more inconvenient. It will be a little more expensive. However, consider it an investment in building a stronger country, a country that can, once again, be proud of what it makes and exports throughout the world. There are many more. It is worth checking out several to find the ones(s) that have what you want and that you are most comfortable working with. There are even some higher profile efforts like the one Glenn Beck recently launched http://www.1791.com. The products, while not cheap, are made largely by single mothers in need of employment. You may even want to keep looking as you go about your normal shopping patterns. During a recent visit to a firearms shop, I was looking at two nearly identical weapons. One was made in Arizona and one in Brazil. The domestic product was a few dollars more, but the satisfaction of buying a product put together by American workers was well worth it. I know times are tough, and many families need to make every penny count, but we need to take a little longer view of our economy and, as much as possible, pass up short term benefits for the longer term value of a strong and prosperous country. This is something we can do and not even Barack Hussein Obama can stop us. Labor Day: An Anachronistic Holiday?